In the Malayalam language "kettu" means "to tie" and “vallam” means boat – the two together make the local name "kettuvallam”. Each houseboat is constructed using the ancient principles and techniques of boat building by the local carpenters using 'Anjili' wood. Coir ropes are used for fastening the wooden planks together. Our boats listed in 114 boats which mentioned as safe boats at alappuzha. What is a House Boat? 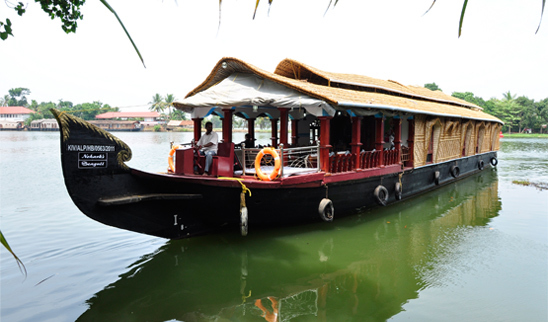 Traditionally, the Kerala houseboats been called Kettuvallam, which means a boat made by tying together pieces of wood. Jack wood planks are joined together with coir rope and then coated with black resin made from boiled cashew nut shells are used to make these huge house boats. The Kerala Houseboats usually has one or two bath attached rooms, an open lounge, deck, kitchen and a crew comprising two oarsmen and a cooks. A kettuvallam is about 67 feet in length and has a width of around 13 feet in the middle. The materials that go into the making are local and ecofriendly; bamboo poles, coconut fibre, ropes, bamboo mats, carpets etc. The main wood used is "Anjili" (Artocarpus hirsuta). There are houseboats with fully furnished single room, double room and triple rooms.